does not receive any keyboard input. It is not possible to trigger the "got here" message nor cause it to terminate using Escape; instead all keypresses show up in the terminal window from which the script was run. This happens even though the window appears to have focus. Additionally, based on the mouse event handling, the window exhibits some combination of the incorrect mouse behavior described in these two issues: https://bitbucket.org/pygame/pygame/issue/79/pygame-incompatible-with-osx-lion-trackpad https://bitbucket.org/pygame/pygame/issue/163/no-mouse-move-events-unless-mouse-button viz. all subsequent clicks register with the same position as the first one, and the only way to update its position is to click and drag to a new location. Just wanted to mention that I ran into this issue as well. I got around it by installing the MacPorts version (py27-game) which is an earlier version (1.9.1_8). It only addressed the keyboard input issue...I have not tried the mouse yet. I cannot use a different python version because my project depends on asyncio. It works perfectly under linux, this is probably a OS X specific issue. Please tell me what i could do to help. "I cannot use a different python version because my project depends on asyncio." Think about using virtualenv, which aims to separate out the dependencies for multiple Python projects. It really makes a huge difference. Any workarounds on this (without using python 2.7)? After some debugging, I found that I was only affected by this if inside a virtualenv. Installing pygame systemwide works fine on OS X 10.10.3 with python3, both from python.org or homebrew. If one can cope without all the SDL-features, one can get pygame working inside virtualenv by using pygame_sdl2. We have found a workaround, described in this thread. It means substituting the system Framework Python for the virtualenv one that can't handle windowing properly on a Mac. Thanks @Arve Seljebu and @agiledata for investigating this. Is there any hope of fixing it within pygame? I'm not familiar with OSX, but it seems weird that a Python virtualenv can affect window management. If we don't know of a fix, is there a way we can detect it and warn/error about it? This is likely to do with which SDL was used inside different python environments. We likely need to redo the way this is handled on OSX. Since installing system wide Frameworks is really not a good idea in modern OSX (and probably never was). Issue #244 was marked as a duplicate of this issue. The problem is to do with the difference between framework and not-framework builds on OSX. That's good to know. If it is the same and mpl hasn't fixed it, I suspect there's not much we can do other than documenting workarounds. The docs you linked to suggest that python3 -m venv works for mpl where virtualenv doesn't. Does using venv also make Pygame behave properly? What should I do if I use conda? Mentioned article says Anaconda is framework build. I successfully installed it with pip being inside my conda environment. And code starts, but with now visible window. Have you tried it in conda? If our suspicions are correct, and those docs are right that Anaconda is a framework build, it should work. 2016-12-06 04:48:20.471 python[45197:1243798] 04:48:20.471 WARNING:  140: This application, or a library it uses, is using the deprecated Carbon Component Manager for hosting Audio Units. Support for this will be removed in a future release. Also, this makes the host incompatible with version 3 audio units. Please transition to the API's in AudioComponent.h. I've also tried 1.9.2b12 version. didn't help. From your screenshot it looks like it's opening but not getting focussed. If you switch to it before you die, can you move the car with the left/right arrows? @Thomas Kluyver yes, window is created, but when I select it I see it for a split-second and then I see my console again. So, no, I can't move a car. Other people: does Aleksandr's description match what you see? Is there a way to check if Python is a framework build? 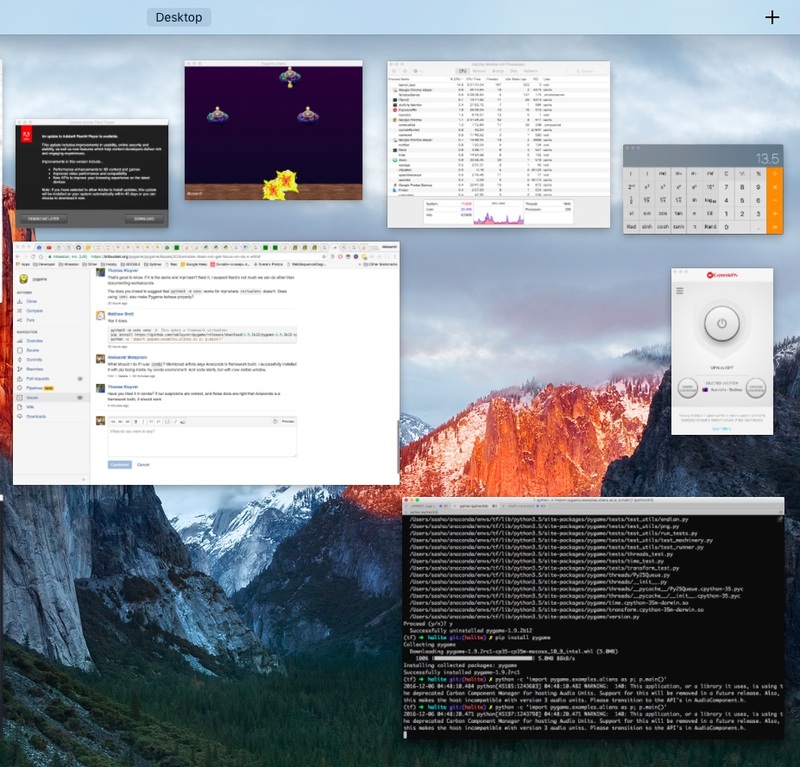 I tried @Matthew Brett 's solution (adjusted for my game since the github download link doesn't work anymore) and OSX still doesn't give me focus of the window. Is there a documented best workaround yet for this? I want to echo Chris Dugan's question about a documented best workaround. I was testing a friend's code on my Mac OS system and ran into the issue. Matthew Brett's solution does not work for me, either. Then, everything is ok . I'm also seeing this issue. With Python 3.6.3 and pygame 1.9.3 installed with Anaconda, the window launches, but never gets focus, and arrow keys never register. With Python 2.7.13 and pygame 1.9.3 installed with Anaconda, everything works as expected. This is on macOS High Sierra. For now, I'll drop back to Python 2, but Python 3 support would be nice to have. same problem. window can't get focus and can't receive keyboard events. with python3.6(conda) and pygame 1.9.3 in mac10.13. It would seem I'm having the same issue in a venv, however I'm on windows. I have anaconda installed, however I'm not using it. I think the Windows thing would be a separate issue. All the technical details and possible solutions that have been discussed here are Mac specific. Figured out a workaround. If my editor (and browser, on the other screen) is (are) in fullscreen mode, then PyGame's GUI will appear on top of everything. Even on top of your fullscreen terminal. It's odd, but it works like a charm. So, it's a nice bug which bugs a bug, making everything just fine.